The 4th Annual Lion’s Den DFW Pitch Competition Made a Significant Impact for Faith Driven Entrepreneurs of The Future. The Lion’s Den mission is to connect companies with investors through a Christian business pitch competition where business leaders can use their wealth and experience to change the world and make an impact, and this is exactly what happened at this year’s conference! My name is Reid Strickland and I am a senior at Dallas Baptist University. My hometown is Waco, Texas. My major is entrepreneurship and after graduation I plan first to go out and get a business job of some sorts in order to get experience under my belt. In five to ten years after graduation and after getting some experience, I would like to open a coffee shop that is mission oriented. Previous Lion's Den Keynote Speaker and Pitch Company, Erwin Brothers Films, Hosts Movie Premiere in Dallas this Month. Tickets Available Now. One year ago everyone was shocked when Lion's Den co-chair Vip Vipperman stepped to the stage and announced a six figure investment had been made only minutes after the Erwin Brothers' keynote presentation. 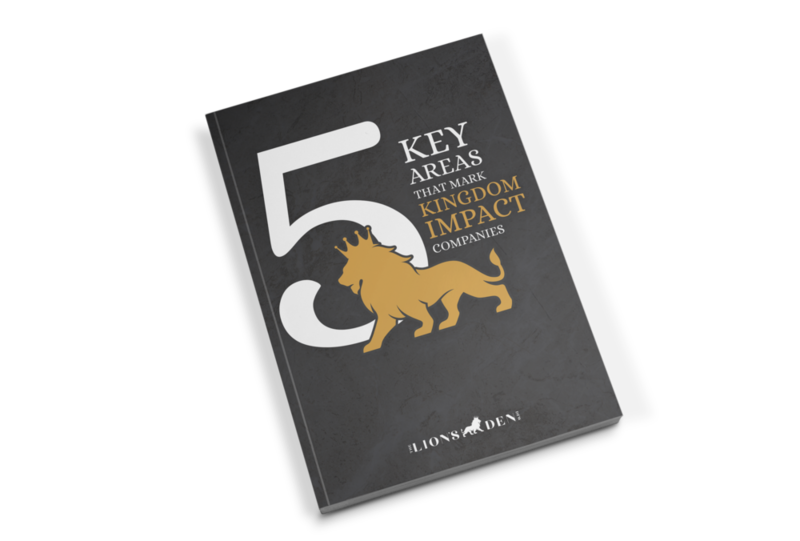 Never before in Lion's Den history had a company received investment so quickly after sharing their message. Now the investment has come to life on the big screen in their newest film, I Can Only Imagine. Join MercyMe's lead singer Bart Millard, the film’s producers and directors Jon and Andy Erwin, the films co-writer and composer Brent McCorkle, co-executive producer Joshua Walsh, cast member Madeline Carrol, and other special guests for this incredible movie premier event Saturday, March 17 at Southlake's Harkins Theater in the Southlake Town Square just west of DFW airport in the heart of the DFW metroplex. Taking Action. That is how The Creator has hardwired so many of us. Even more than that, building relationships through action really fires our engines. So with that in mind we put together this list of resources for so many of our attendees who after our recent event are keenly interested in taking the next action steps in values based investing, starting a new business, or pitching their business to interested investors. This list is by no means exhaustive, so if you would like to be added or know of another business that should be please email us by clicking here. May 27th, 2016 was an incredible life changing day. I was and still am in awe of God for bringing together business and ministry leaders from 4 countries, 8 states, and 28 cities to invest in businesses that will take the good news to the ends of the earth. Anticipation was high when the companies arrived for rehearsal Monday afternoon. The 11 companies pitched their businesses and 10 panel judges that were split into two different sessions came at them with challenging questions and words of encouragement. The audience voted live throughout they day and audience favorites were chosen in the areas of Innovation, Mission Integration, and Business Model. Both panels got to choose a panel favorite as well. You can see the results and a picture of the winners on our Facebook page by clicking here. The response to The Lion’s Den DFW 2016 was better than our core could have imagined with many people responding that they were encouraged spiritually and a least 3 companies who pitched already have active investor engagement with one of these companies already receiving investment funds. Tim Day of Daylight Solutions discussed their tremendous growth since pitching at The Lion’s Den in Birmingham just 6 months before. Joel Montgomery of Bravewave Labs brought a great message on how to become a high growth company. We were amazed that we had such good engagement from two local groups, incubators and universities. We had pitch companies from The Dec, attendees from The Grove, and panelists from The Foundry. With 23 incubators in DFW, the opportunities for growth are great. The university connections were also really encouraging. UTD was represented, Simon Mak from SMU brought his whole class and used The Lion's Den as a key part of his 1 week course. DBU also had multiple teachers such as Ross O'brien who built their 1 week classes around The Lion’s Den. We are discussing next year building more classes around the event and using it as a way to engage students on all of the DFW campuses. If you missed The Lion’s Den DFW this May, learn more about the pitch companies and panel involved here, and don’t miss the next The Lion's Den event coming October 27-28 in Birmingham, AL. Click here to register now to pitch, to invest, or to attend. The Lion's Den will be coming back to DFW in Spring 2017 and plans are already in the works. Look for a save the date coming soon. If Adam and Eve (and everyone since them) had not sinned, would we still have companies? I sometimes ask my business students this question. Trying to imagine the world without their iPhones® or a chai tea latte from Starbucks doesn’t sound much like paradise to them. But the question remains, "If sin had not entered the world and completely corrupted God’s perfect creation, would we still have companies that produce goods and deliver services?" To answer this question, we really need to look at God’s original commandments and also examine the nature of companies.